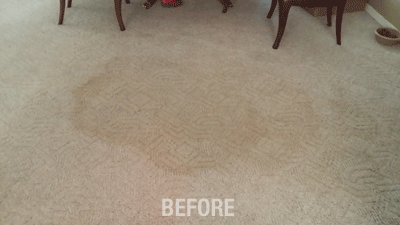 Believe it or not, large water spills can stain your carpet. This large brown stain in Tampa FL was caused by nothing more than water. If water is not removed quickly it can slowly wick dirt from under the carpet pad and up into the carpet fiber, like oil in a lamp being drawn up as fuel for the flame. 1. Get to the stain quickly. The more you can remove before it soaks in the better off you are. 2. Soak up as much of the liquid as possible. Using a white towel, tamp the spot lightly. Using a lot of downward pressure might create the problem you are trying to avoid. You could be forcing liquid under the carpet pad and causing a wicking problem. 3. If the spilled liquid is soda, wine, juice, or something else with a visible color you might need to use some sort of carpet cleaning solvent to help remove the stain. Be sure to tamp and not rub the spot to remove any color left in the spot. 4. If your carpet still feels excessively wet you can use a portable water extractor, carpet stain remover, or wet/dry vacuum to remove more liquid. 5. 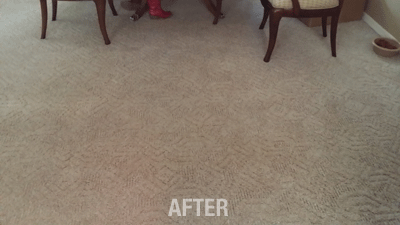 After it dries completely, if the stain is still visible call a carpet cleaning professional to remove the stain.